1. Short Definition: Composting is the transformation of raw organic materials into biologically-stable, humus-rich substances suitable for growing plants. 2. Long Definition: Composting is the biological decomposition and stabilization of organic substrates, under conditions that allow for the development of thermophilic temperatures as a result of biologically produced heat, to produce a final product that is stable, free of pathogens and plant seeds, and can be beneficially applied to land. Thus, composting is a form of waste stabilization, but one that requires special conditions of moisture and aeration to produce thermophilic temperatures. The latter are generally considered to be above 45oC (113oF). Maintenance of thermophilic temperatures is the primary mechanism for pathogen inactivation and seed destruction. Compost is an organic soil conditioner that has been stabilized to a humus-like product that is free of viable human and plant pathogens and plant seeds, which do not attract insects or vectors, that can be handled and stored without nuisance, and that is beneficial to the growth of plants. The method of composting that we use with all O2Compost Systems is referred to as Aerated Static Pile (ASP) Composting. This simply means that we induce airflow through the mix of materials using an electric blower - we do not turn the pile during the active phase (first 30 days) of composting. 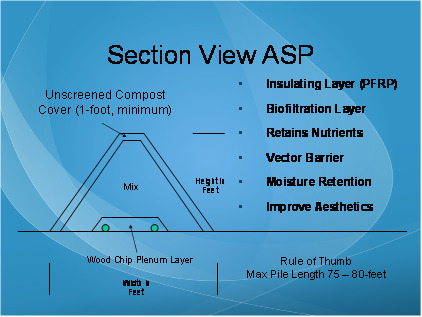 ASP composting was originally developed by the U.S. Department of Agriculture in the mid-1970’s and is used throughout the country to process a wide variety of municipal organic waste materials. We have simply taken this technology and adapted it to work with smaller volumes of organic waste materials in various on-site settings, including agricultural, industrial, municipal and institutional (e.g., universities, military bases, prisons, etc.). In designing our compost systems, our primary objectives are to: 1) protect surface and ground water resources; 2) reduce the time and expense now committed to manure management; and 3) produce a high-quality finished product for use around your farm, local community gardens, or to sell to gardeners in the area. Our goal is to provide a compost system that becomes fully integrated into your daily activities. With aerated composting we maintain aerobic conditions throughout the compost pile and are able to control pile temperatures. This, in turn, expedites the composting process and yields a high-quality compost product that is effectively free of pathogens, parasites, and weed seeds. By composting in this manner, we are able to control offensive odors and flies, improve the aesthetics of the waste handling area, quickly produce a superior product and reduce the cost of labor and equipment (i.e., fuel, maintenance, etc.). Many years ago, the U.S. Environmental Protection Agency (EPA) conducted exhaustive risk analyses involving the processing and use of composted biosolids (wastewater sludge) products. Upon completion of this work, the EPA established the minimum criteria used for meeting human health objectives. These criteria are stated in the body of regulation entitled 40 CFR Part 503, (also referred to as the “503 Regulations”). The technical term for the minimum criteria to produce a Class A compost is “Process to Further Reduce Pathogens” or PFRP. The composting industry has adopted these criteria for virtually all organic waste materials to ensure that finished compost products are safe to use. Salmonella sp. Bacteria must be less than 3 MPN per 4 grams of total solids (dry-weight-basis). Biosolids (sludge from wastewater treatment plants). Things that cannot be composted include plastic, metal, glass and rock (referred to as contaminants). Woody materials, such as wood shavings (i.e., horse stall bedding) and chipped tree limbs take a considerable amount of time to decompose, even with an aerated process where the biology of the system is optimized. To produce a finished product with a uniform, soil-like texture, these coarse woody materials are typically screened out of the finished compost. The initial mix of materials (i.e., the blend of feedstocks going into the compost system) controls the composting process and predetermines the quality of the finished product. The following list provides the target ranges for the five primary parameters. In addition to these six parameters, it is important that the initial mix be a homogeneous blend of materials, and not stratified. Layers, such as grass clippings, straw or paper products, will collapse during the composting process and impede uniform airflow through the mix. NOTE: Maintaining a moisture content in the compost pile of >50% is of critical importance. If the moisture content drops much below 50%, the biologic process stops and no further decomposition will occur. Rewetting the pile by sprinkling it from the to / outside is not effective because the outter layer, once it becomes wet, will act as an “umbrella” and it will shed water, not absorb it. Additionally, if the compost mix gets very dry – <40% moisture content – it will become hydrophobic making rewetting a very difficult chore. The only way to effectively rewet a compost pile is to break it down and thoroughly wet the mix with a high powered hose. This is frustrating, time consuming and it certainly does not meet our objective of reducing our inputs of labor and equipment time. There are three distinct components of an aerated compost system, including 1) the plenum layer; 2) the initial compost mix; and 3) the compost cover. Examples of an aerated static pile and an aerated bin system illustrate these components (Refer to Figures 3-1 and 3-2, below). The plenum layer is located on the bottom of the pile and typically consists of coarse woody material. The purpose of this layer is to allow the airflow to be distributed evenly across the base of the pile. It is important that this layer be sealed on all sides by the initial compost mix to maintain pressurized airflow and prevent “short circuiting” to the open air. The initial mix consists of the feedstocks that are being composted. This represents 90% or more of the pile volume. The initial mix parameters need to meet the target values, as described above. 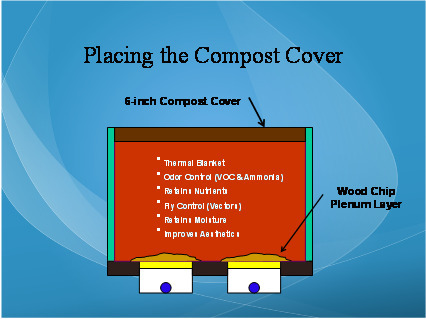 The compost cover is placed on the top of the pile and consists of previously composted material that meets the criteria for a Process to Further Reduce Pathogens (PFRP), as described above. For compost bins, this layer should be at least 6-inches thick and for aerated static piles, it should be at least 1-foot thick. The cover provides a thermal blanket to ensure that all “raw” feedstocks reach temperatures suffient to destroy pathogens, parasites and weed seeds (131oF for at least 3-days). It also serves as a biofilter for odor control. The odorous gases (i.e., volitile organic compounds, or VOC’s) that leave the pile get absorbed in the cover layer and are digested by the micro-organisms that reside there. In addition to helping manage odors, the compost cover also retains nutrients, mostly nitrogen. The biofilter layer is every efficient at retaining ammonia that would be emitted from the pile. The cover also acts as a vector barrier (vectors include flies and other insects, birds and rodents). Any fly larvae in the mix will “cook” in the high heat of the pile and because the cover consists of stable compost, it does not serve as a breeding habitat for flies and insects. Birds and animals that may be inclinded dig into the pile will quickly realize how hot the mix is and will stop abruptly. The cover layer helps retain moisture in the initial mix of materials. When air is delivered to the base of the pile, it will heat up and pull some moisture out of the pile. This effect is compounded when the top of the pile is dry due to evaporation (exposure to the sun). By wetting down the compost cover layer we are able to retain more of the moisture in the core of the pile. Finally, the cover layer improves the overall aesthetics of the compost system. While this may seem like a minor issue, the saying “People smell with their eyes” is absolutely true. Good housekeeping around the compost system will let people know that you are composting in a proper fashion. This is particularly important when dealing with highly putrescible (i.e., potentially malodorous) feedstocks such as food waste, fish by-products, mortalities, etc. 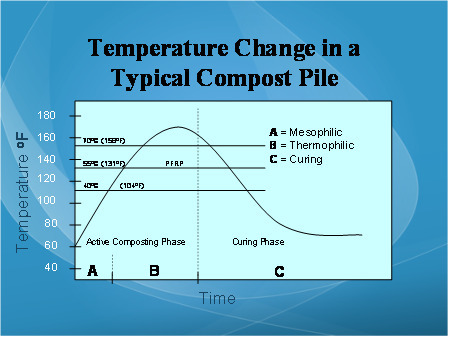 The life cycle of a compost pile is graphically illustrated in Figure 3-3, below. The vertical axis of the graph represents the temperature of a compost pile in degrees Fahrenheit and the horizontal axis is time. The range in time depends on the method of composting and the types of feedstocks, but in general it represents roughly 30 to 60 days. The curved line represents a series of temperatures at a specific location within the pile over a period of several weeks. In this illustration, the curve line assends to a peak temperature of approximately 170oF, and then decends steadily to approximately 65oF where it then stabilizes. The Thermophilic Phase is much longer lived and represents the time interval when the pile temperature is above 104oF. Zones A & B are also referred to as the Active Phase of Composting, and this typically lasts 21 to 30-days. The Active Phase is predominantly a bacterial driven process wherein a wide variety of bacteria consume the readily available forms of carbon (protiens and carbohydrates). Their metabolic process results in the production of CO2, water and great deal of heat. We utilize this heat to destroy pathogens, parasites and weed seeds in the mix. The subsequent Curing Phase is the longest lived phase of the composting process and is predominantly a fungal driven process. The fungi serve to degrade the more resilient forms of carbon (hemi-cellulos, cellulose and lignin), and ultimately produce a compost product with a soil-like appearance. Curing generally take 30 to 60 days to produce a finished bulk product, however curing should be allowed to continue for at least 6-months for a bagged product. The vertical line that divides Zones B and C is dashed to represent this as being a transitional process, not a definitive point in time. Different areas of the compost pile will undergo this change at different times, depending on the temperature regime. There are three horizontal lines which represent temperatures of 104oF, 131oF and 158oF, respectfully. The 158oF line represents the temperature at which the heat limits the number and diversity of bacteria in the compost pile and the system become inefficient. With composting, hotter is not better. Because compost is self-insulating, once a pile gets hot it tends to stay hot unless we take some action to remove the heat from the pile. The temperature curve represented in Figure 3.3 is idealized to illustrate a concept. 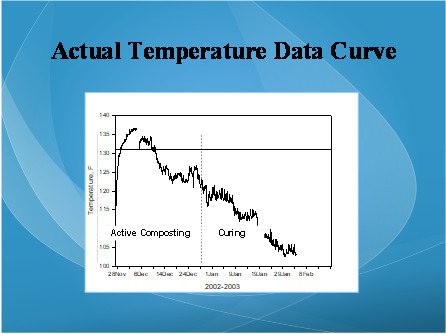 The temperature curve shown in Figure 3.4, below was derived using actual data and is more representative of the true life cycle process of an aerated compost pile. When an O2Compost System is used to process animal manure, each bin is generally filled over a period of 3 to 4 weeks. During this period, the manure begins to decompose aerobically around the perifery of the pile and anaerobically within the core of the pile. The pile core temperature is often 130 degrees or higher, even without airflow. When the raw feedstocks near the top of the bin, they should be raked out to form a level surface and then covered with a 6-inch (plus) thick layer of finished compost (refer to Section 3.8). At this point, the airflow is started, with a typical cycle time of 30-seconds On / 30-minutes Off. With every On Cycle, fresh air is infused throughout the compost pile and within 12- to 24-hours the pile temperature will typically jump 30o to 40oF. When the airflow is first started (the first cycle or two), you will likely notice a strong, pungent odor emitted from the pile. This is a direct reflection of the mix being in an anaerobic state. Within a few cycles, however, the odors will convert to a “friendly” organic fragrance and these will further soften over the next few days of composting. Sufficient airflow to cool the pile down. By further increasing the airflow, we are able displace heat from the core of the pile and replace it with cooler, ambient air. There is an inherent comflict with this situation, one that requires compromise. As I stated in Section 3.9, high pile temperatures (much over 158oF) result in the reduction in the number and diversity of bacteria in the compost pile and the composting process becomes inefficient. However, as stated in Section 3.7, if the moisture content of the mix drops much below 50%, the composting process stops altogether. This problem is greatly exaserbated during the winter months when we introduce cold ambient air into the compost pile. Cold air is also very dry air and once heated it’s moisture holding capacity can be very high. Under these conditions, it is very easy to dryout a compost pile by over-aerating it. Therefore, we need to be very careful with our rate of aeration to avoid drying. As I said above, you cannot wet down a dry pile by applying water to the surface. The pile needs to be broken down and all of the dry materials need to be rewetted incrementally as the pile is being reconstructed. Needless to say, we want to avoid this if at all possible. The Compromise: “It is always better to have a pile that is too hot than a pile that is too dry”. The principle means of managing odors at compost facilities is to maintain aerobic conditions throughout the compost pile. However, “the rather obvious odor from anaerobic metabolism has led to a widely held belief that if composting is fully aerobic there will be no odors. This simply is not true. “Many low molecular weight, odorous intermediates are produced even during aerobic composting. Ammonia (NH3), acetic or pyruvic acid, and citric acid are examples. The aerobic intermediates are generally less obnoxious to humans than their anaerobic counterparts, but they are not odor free. The objective with composting is to manage odors, not eliminate them. With O2Compost Systems, the first few aeration cycles will displace anaerobic off-gases from the core of pile resulting in a short term impact near the compost system. Within a few aeration cycles, however, the character of the odor will “soften” considerably. For this reason, and because we always add a biofilter cover layer on top of the pile, we never have complaints about our compost systems generating offensive odors. The macro- and micro-nutrients found in raw manure are considered unstable because they are mobile and can leach out of the manure and impact surface and ground water resources. During the Active and Curing Phases of composting, the bacteria and fungi that do the composting work for us, also convert these nutrients into more stable forms. As a result, the nutrients in compost become slow release and are gradually contributed to the soil over a several year period. The most definitive way to evaluate compost quality is to conduct laboratory tests on a representative sample. A representative sample is one that has been combined from a number of “grab samples” gathered from several locations in the compost pile. A thorough discussion regarding sampling and laboratory testing is presented in Section ___ of this Training Manual. A second reliable way to evaluate compost quality is to conduct a simple growth trial. Compost is a soil amendment and should not be used exclusively as a planting medium. By treating some plants and not others and then comparing the growth of these plants over a period of weeks, you will very likely see a significant difference in amount of foliage, flowers and fruit that are produced. There are two ways to set up a growth trial: first compost can be blended in with existing soil or a potting medium (e.g., a bagged planting mix) at a rate of 25% to 50% by volume. Second, it can be used as a “top dressing”, where a small amount is placed directly on the top surface of the soil. When the soil or potted plant is watered, the nutrients are drawn out of the compost much as tea is drawn from a tea bag. A third way to evaluate compost quality is to smell it. That’s right – You Can Smell Compost Quality! A good quality compost should have a soil-like fragrance, often referred to as a “forest duff odor”. It is a mild organic odor that may remind you of when you “played in the woods as a kid”. If your compost has a strongly-sweet or sour-acrid odor, it is not yet fully stabilized. Set your compost aside, make sure that it is moist, and allow more time for curing to take place. Note: It is always a good idea to cover your curing pile with a tarp to: 1) prevent excessive leaching of the nutrients; and 2) keep wind-blown weed seeds from finding a new (warm and nutrient rich) place to call home.